Right on the beach with views to die for! Shoreline Villa is a stunning property in a truly magical location. 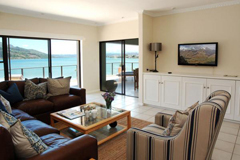 Set in a beautiful, sheltered bay in one of Knysna's most sought-after areas, this attractive villa-style home is literally on the beach of Knysna's picturesque lagoon and just 2 minutes from The Heads. 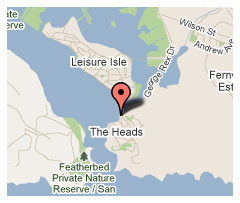 Anyone looking for the perfect family holiday will love this luxurious house and the beautiful beach on its doorstep. The incredible views across the lagoon to Featherbed Nature Reserve and Outeniqua mountains – plus the ability to step from your patio & braai area onto the sandy beach – makes Shoreline Villa a very special place. Arranged on 3 floors, the property is well furnished and equipped and can sleep 6 people in 3 bedrooms in the main residence plus an additional 2 small children on sofa / day beds in the two double rooms. It has the added benefit of a further self-contained apartment at beach level sleeping 4 extra people. The bright, welcoming accommodation comprises: Street Level: Attractive entrance hall leading to 2 spacious bedrooms. "You have a great family house and we enjoyed every moment of our stay." 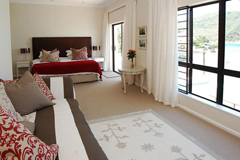 "Shoreline Villa is situated in a perfect position for exploring Knysna itself or further afield along the Garden Route. 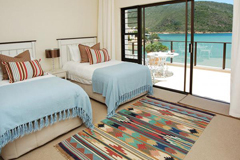 The Villa is lovely and immaculately maintained with fantastic views across the lagoon from the different terraces." We offer special rates during off peak seasons! Click here to view large map.